The Washington secondary doesn't have love for the Raiders. Always vocal cornerback Josh Norman went after receivers Michael Crabtree and Amari Cooper following the a 27-10 loss at FedEx Field Sunday night where the Raiders offense could do nothing right. Cooper and Crabtree had two catches for 13 yards combined, giving Norman license to go off. He wasn't the only one to do so. Safety D.J. Swearinger had some unflattering things to say about Cooper and running back Marshawn Lynch on Instagram. Like Norman, he wasn't terribly nice. Or polite. Swearinger posted a photo of himself lording over a fallen Cooper, on the ground clutching his helmet. 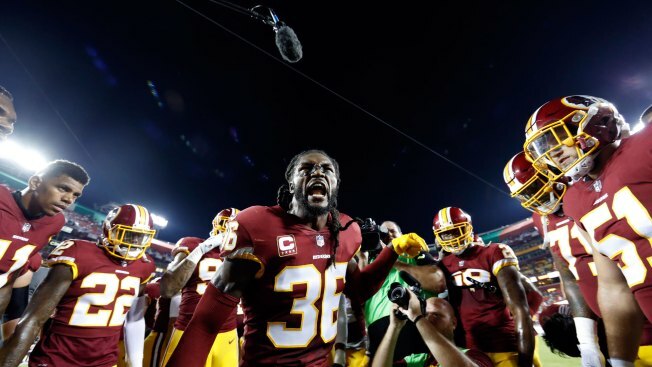 Swearinger told ESPN.com in Washington that he mentioned that in a Thursday position meeting at Norman's house. Norman said an exchange occurred in pregame warm-ups. It's also uncertain if that took place. Swearinger also put Lynch in the crosshairs, posting a video of a crushing blow delivered to the physical Raiders running back. He said "I eat Skittles, too," and "Ima show you how to dance," referring to Marshawn's moment a week earlier against the New York Jets. #2spoonzswagggu籠籠 I Eat Skittles Too!!! Ima Show You How To Dance!!! Better Come Correct When 36 In That Alley Jack!! Oh he ain eat enough skittles Huh?! Give Dat Man Some Skittles!! The Raiders won't have interest in talking about these shots fired, claiming they've turned the page to the next game.